The Best Of Houzz is awarded annually in three categories: Design, Customer Service and Photography. Design award winners' work was the most popular among the more than 40 million monthly users on Houzz. Customer Service honors are based on several factors, including the number and quality of client reviews a professional received in 2016. Closet Works has won in the categories of Design and Service. Closet Works was chosen by the more than 40 million monthly unique users that comprise the Houzz community from among more than one million active home building, remodeling and design industry professionals. "We're so pleased to award Best of Houzz 2017 to this incredible group of talented and customer-focused professionals, including Closet Works," said Liza Hausman, vice president of Industry Marketing for Houzz. "Each of these businesses was singled out for recognition by our community of homeowners and design enthusiasts for helping to turn their home improvement dreams into reality." 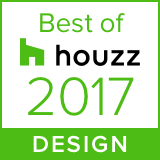 Closet Works designers have also been honored with individual Best of Houzz 2017 awards. View our designers and their outstanding work on their staff portfolio pages.